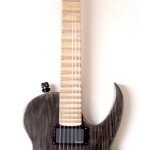 Mjölnir is now available at Wunjo Guitars, Denmark Street, London. 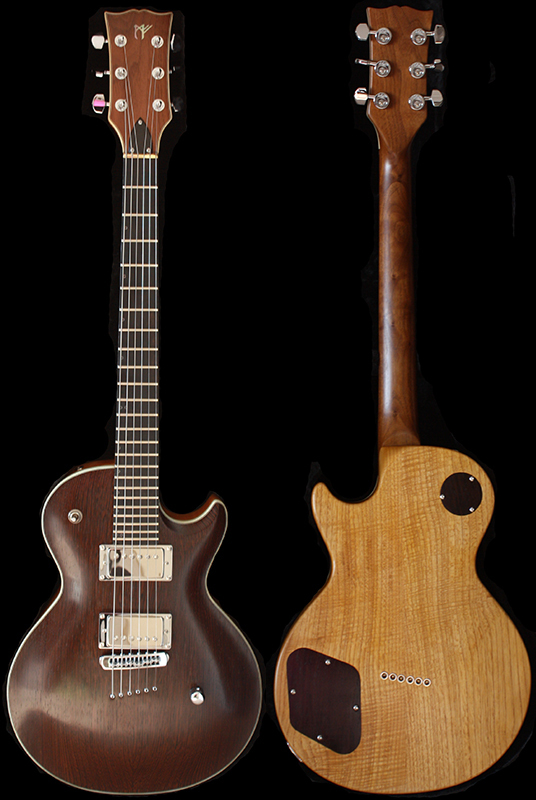 Mjölnir was a project to achieve a guitar that would require no additional adornment other than it’s own figured tone wood. 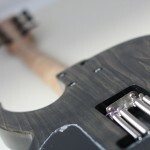 Imparting the spirit of a mythical hammer, I chose a almost entirely chromed finish of hardware to give a feel of steel. I wanted to create a soulful carved-top guitar with maximum tone and sustain; so a string-through body design was an obvious choice. 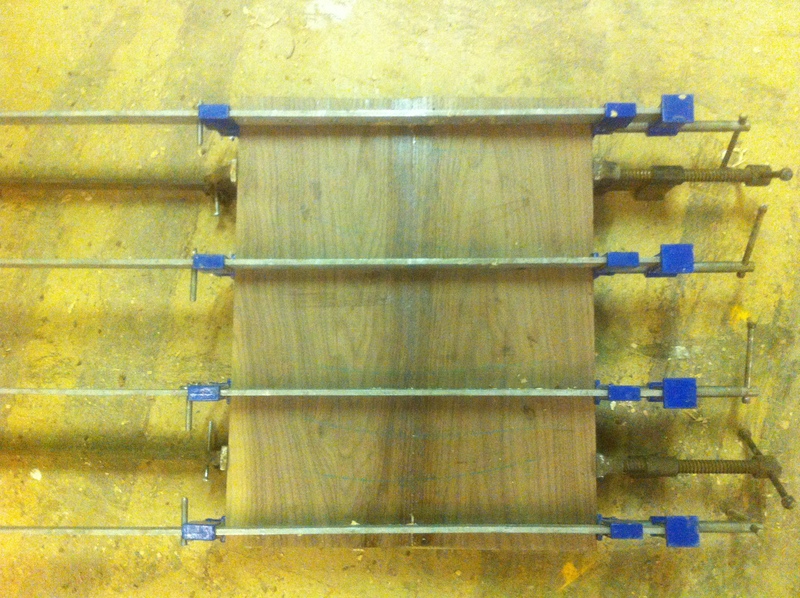 Originally planned as a homage to one of my favourite classic Metal bands, Manowar, this project was born as I listened to ‘Thor (The Powerhead’ at work. 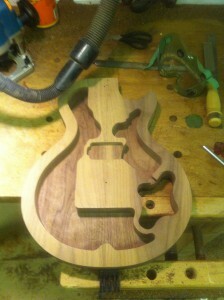 Thor’s hammer Mjölnir was an obvious symbol to base such a guitar on. 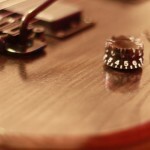 Initially I had designs to inlay the Sign of the Hammer symbol across the fretboard in Mother of Pearl. 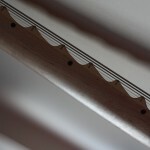 However after offering up the designs to the fretboard, there was no acceptable area to apply the inlay without obscuring the image too much or damaging the aesthetics of balance. 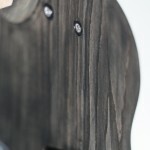 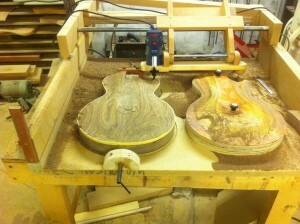 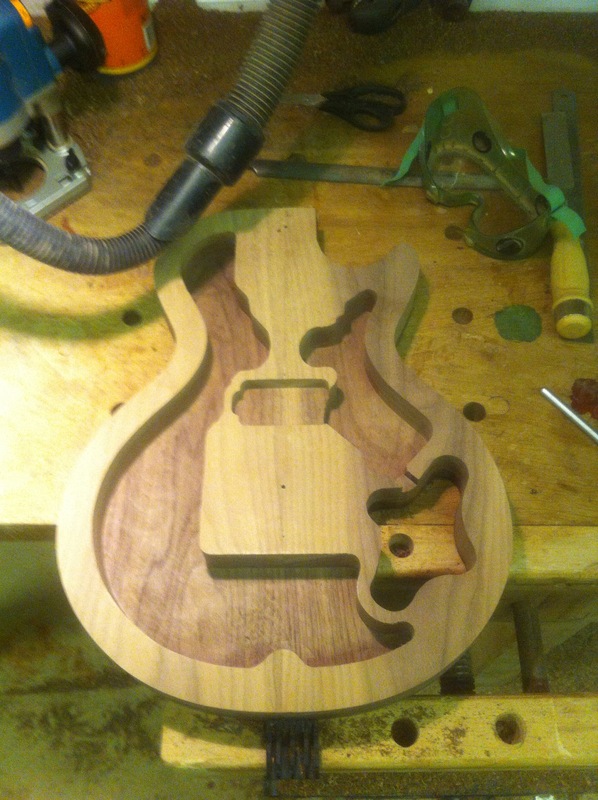 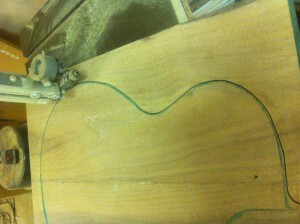 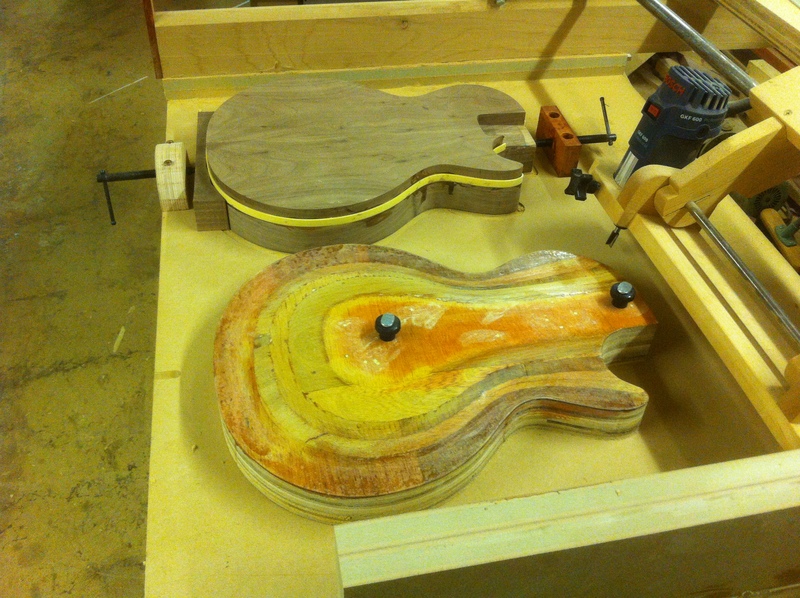 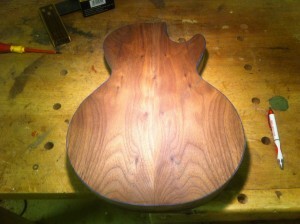 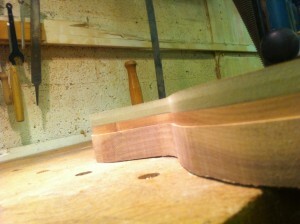 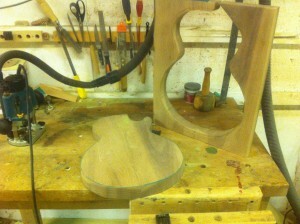 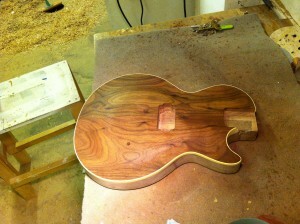 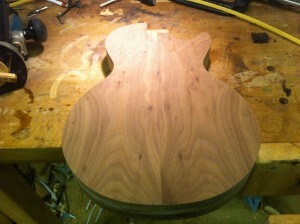 Inlaying the design on the body itself would have taken too much away from the beautifully figured Wenge top. 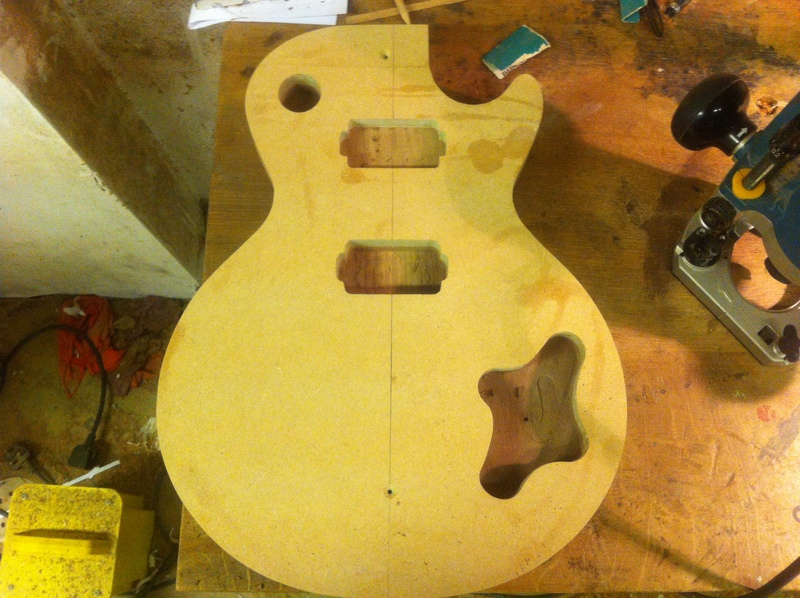 Therefore the fretboard was left totally blank. 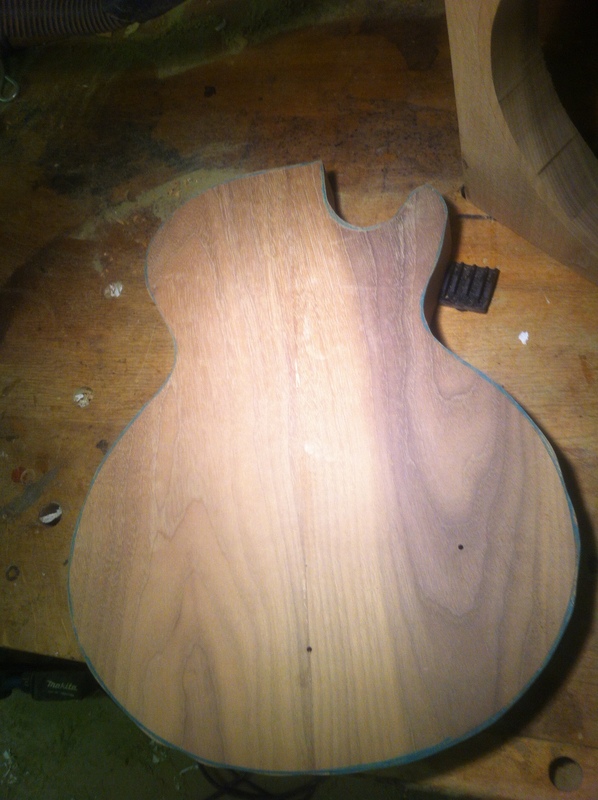 Visually this is beautiful for such a quality piece of Ebony, but this needed to be a work-horse of a guitar. 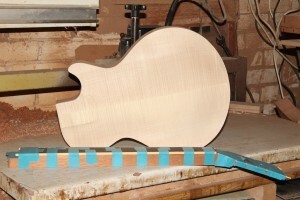 Personal preference is paramount, and in my opinion some indication is required around the higher register of the neck. 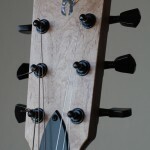 I decided to add steel-ring inlays, offset to the low E-string so that they were easily visible to the player, but as they are aligned closely with the ‘E’ and ‘A’ strings and are not full dots, to the bystander they are almost imperceptible. 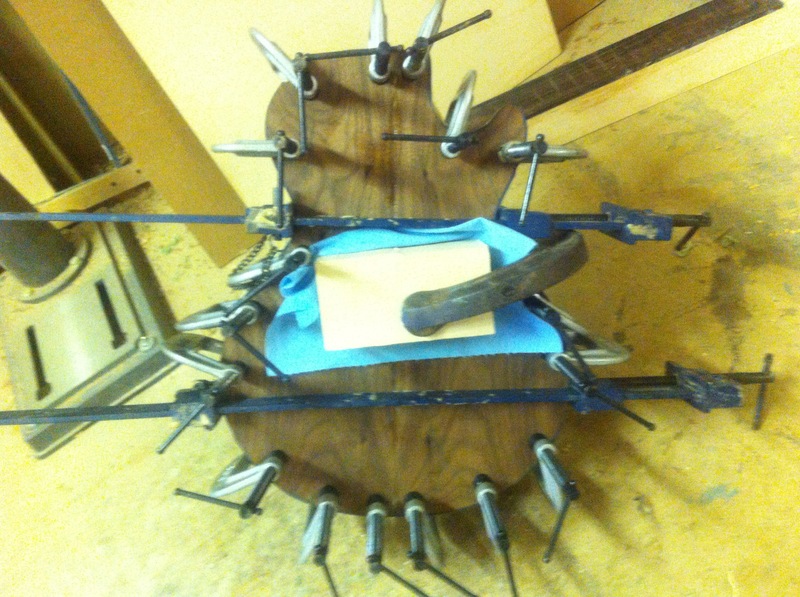 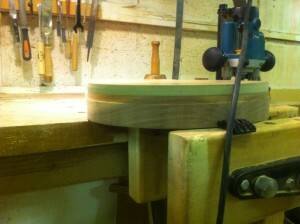 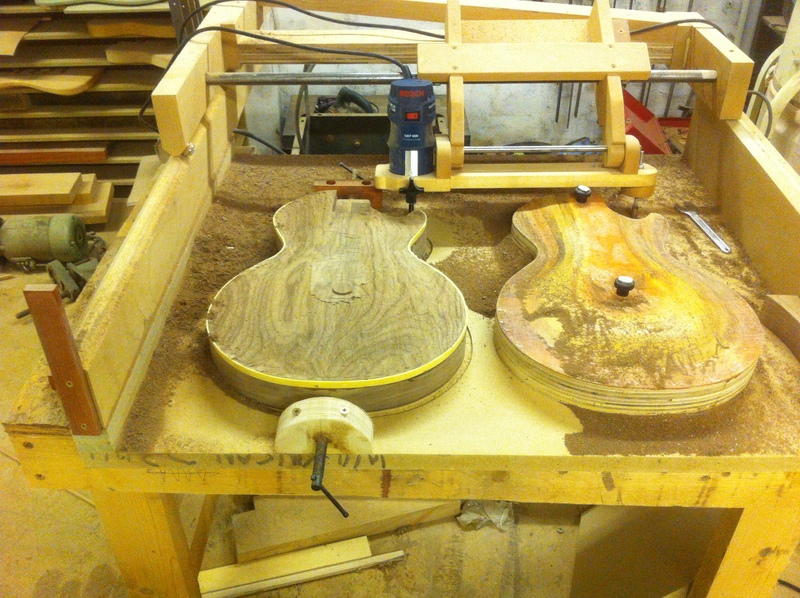 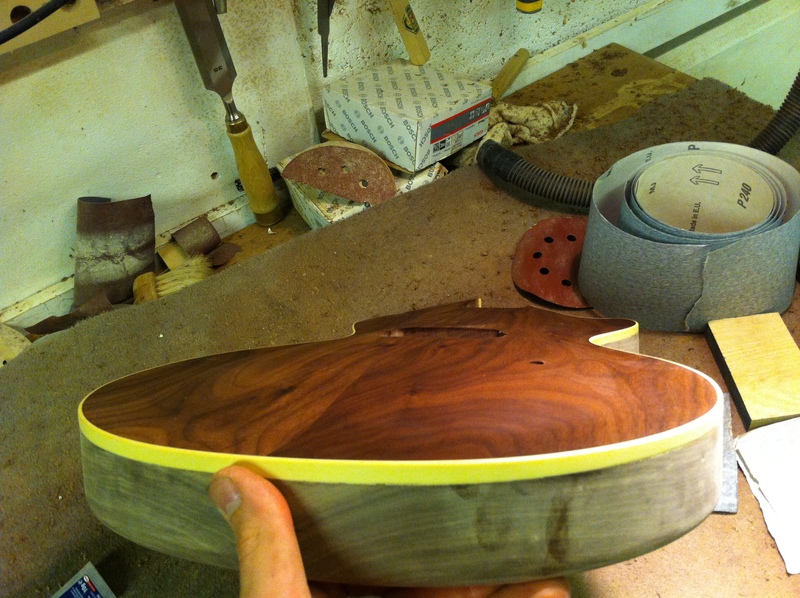 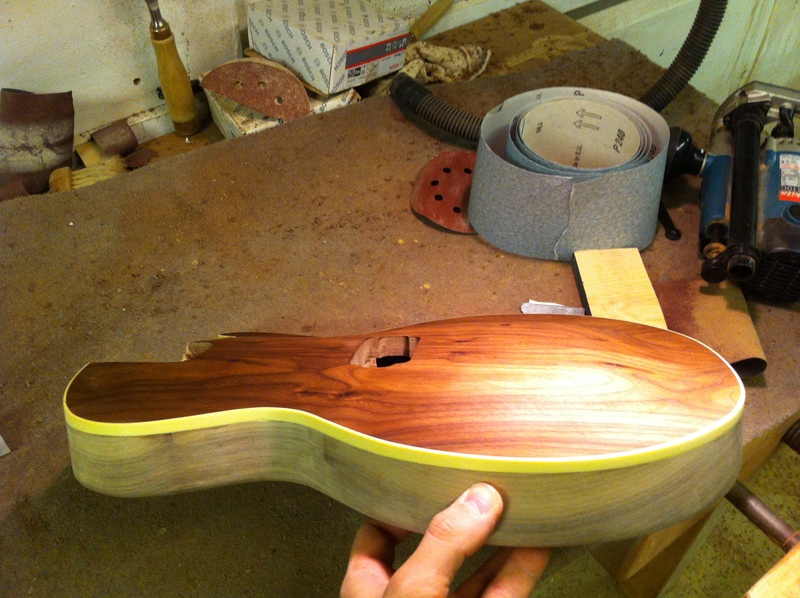 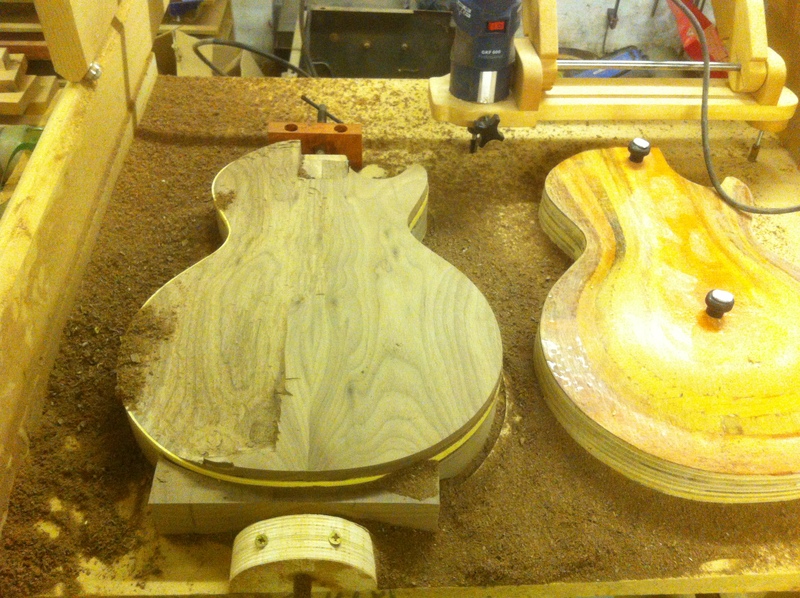 The neck is a one-piece English Walnut, commissioned by Owen Jackson. This was one of two necks I sourced for the Thorn Project, so this has a very petite 41mm nut and Wizard profile. 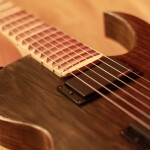 The guys at Crimson Guitars expertly took this bolt-on style neck and adapted it for a set-neck construction in Mjölnir. 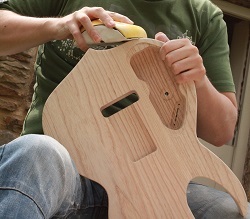 The neck-joint is a very comfortable all-access type, allowing fretting up around the second octave very natural. 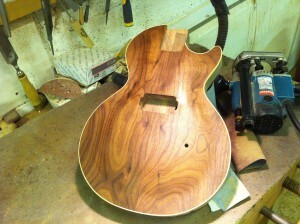 I have yet to find superior pickups available in comparison to Bare Knuckle‘s. 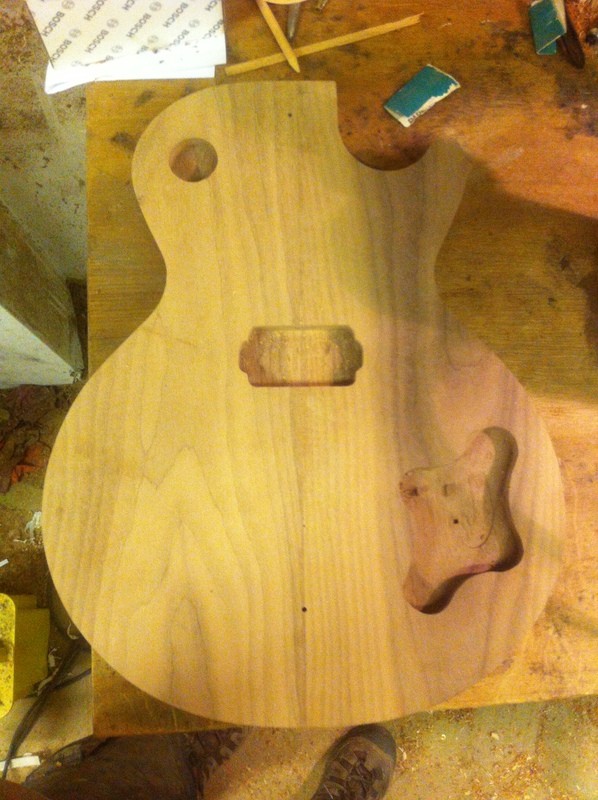 This time I chose a Miracle Man humbucker set, aiming for a slightly more trebly tone for achieving the ferocity of pinched harmonics. As will be apparent from my existing portfolio, I am not a fan of tone pots. 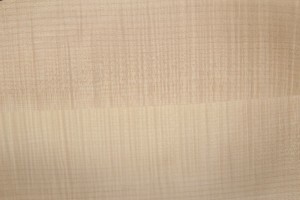 I believe you can achieve all the tonal variations from the placement of the available pickups and choice of amplifier without masking the pure sound of the guitar/pickup combination. 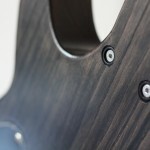 I opted for a single master volume pot in this case to limit the number of controls that would hide the beautiful Wenge grain. 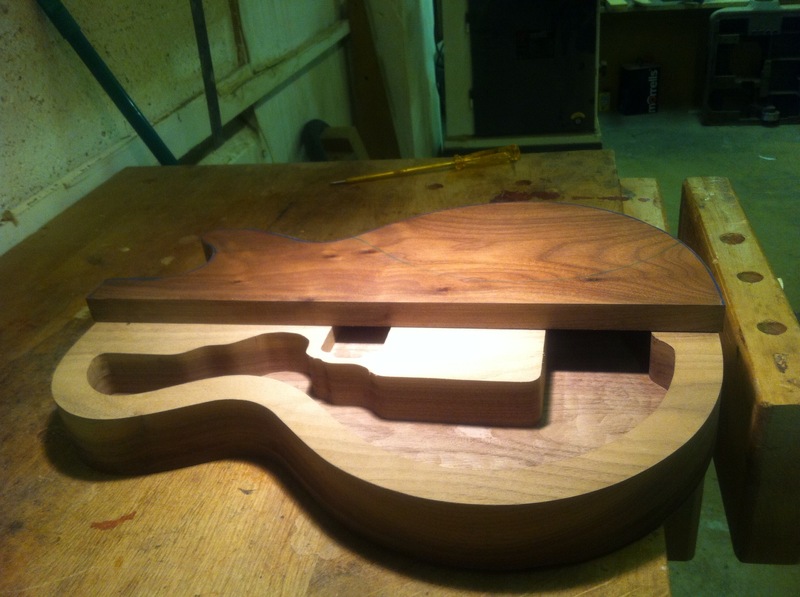 I had this project commissioned by Crimson Guitars in Dorset. As this will be a clear shellac finish ultimately, the importance of quality figured timber was paramount. The carved dark Wenge top will be in stark contrast to the lighter, golden English Chestnut body once the French Polishing is completed. 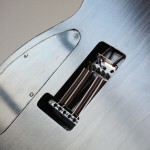 Featuring Bareknuckle Miracle Man calibrated humbuckers at the heart of the body, all other hardware will be in matching Chrome finish. 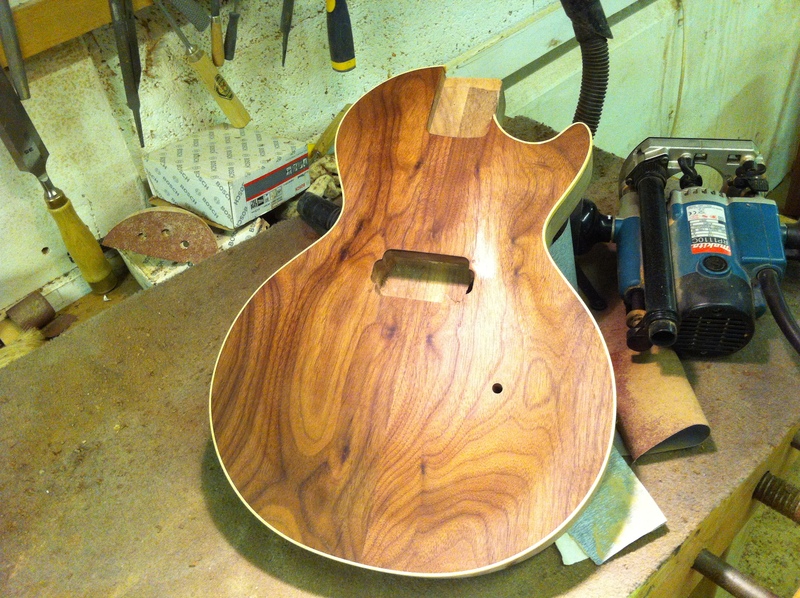 Currently in the process of finishing the build to my specifications, Master Luthier Grahame Pollard has created another masterpiece. 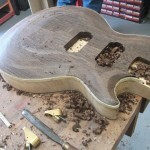 I will receive the project in its barest form ready to be inlayed, stained, finished, wired and set-up over the coming months. 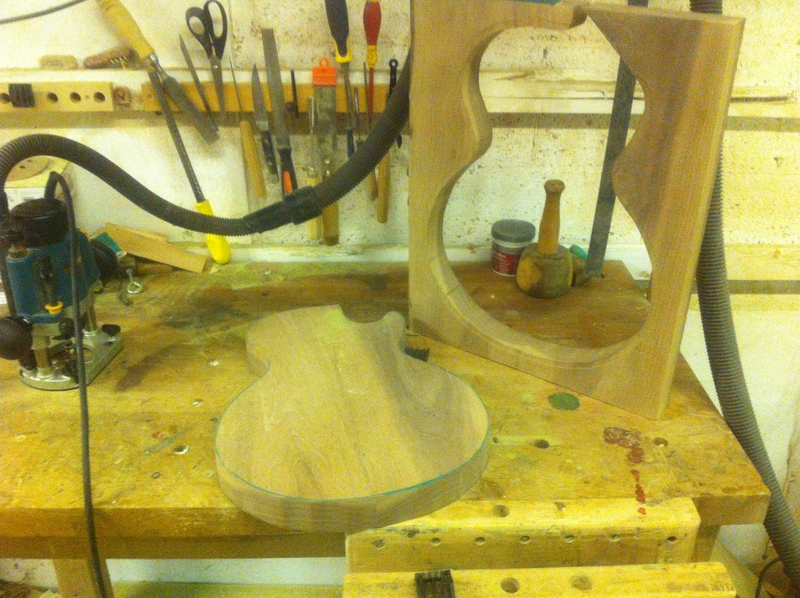 This body (the twin of Muninn) has been cut out and ready for finishing for over twelve months now, since I began the Muninn build. 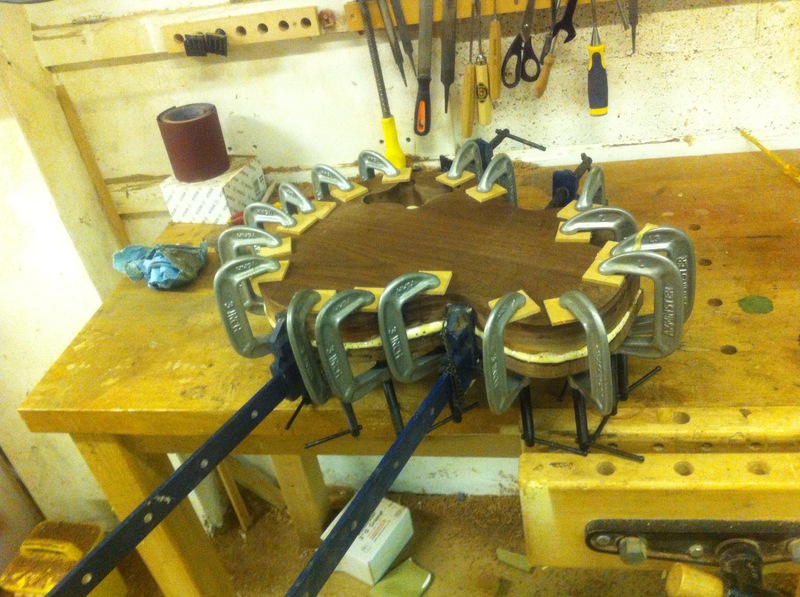 Most of my time recently has been spent on a couple of personal projects, but I felt it was time to crack on with this project now. 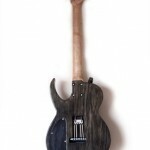 As these two builds have drawn inspiration from two Ravens, a dark finish is a necessity. To set Huginn aside from its twin, I have decided to go with a lighter finish and gold hardware instead of all black. The body has gone through the same black-dyeing process as Muninn to highlight the heavy open grain of the Swamp Ash. 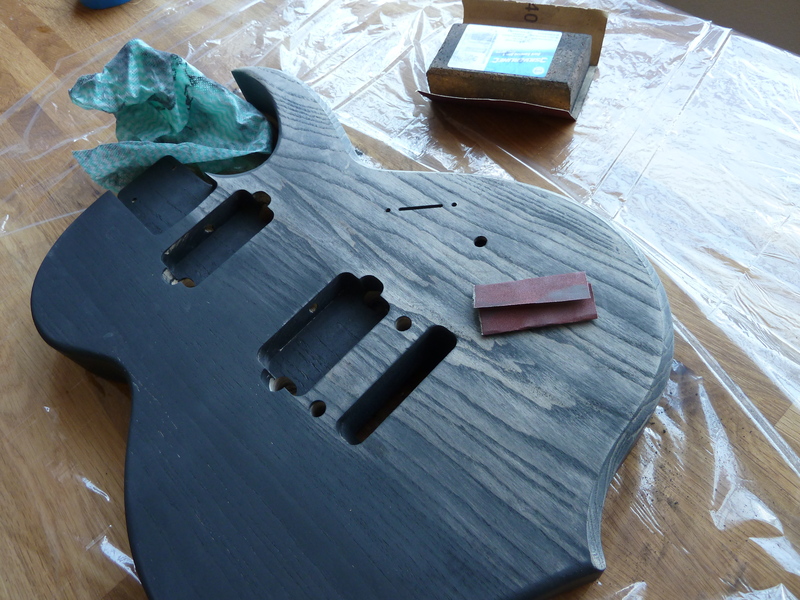 This is then sanded back to 220 grit revealing a much darker figuring where the more open-pored grain retains the black dye. For Huginn though, this has been done on the face and bottom chamfer of the guitar only, the back and sides remain fully black. 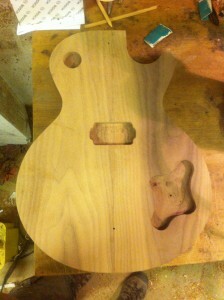 My intention is to then finish the body with a trans-white Wudtone product. 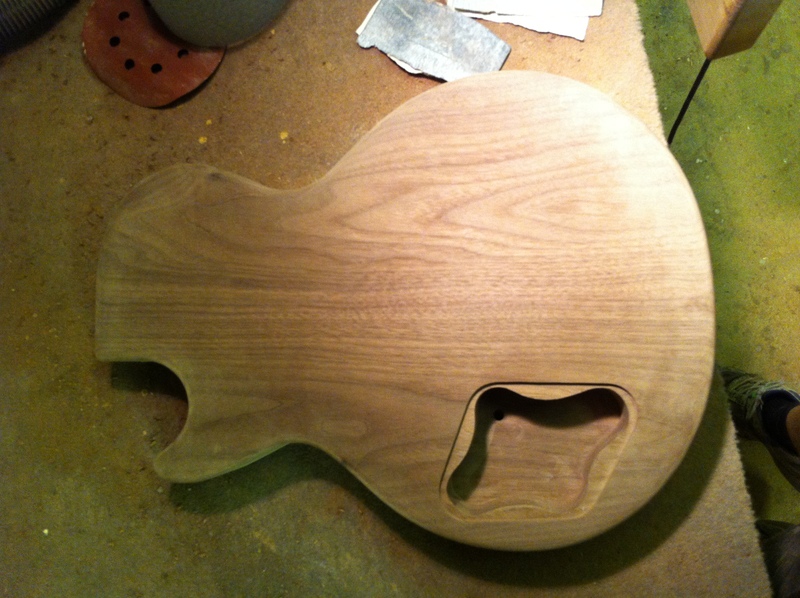 The full black of the back and sides should form a dark grey finish and the top will hopefully be a lighter ashen-grey with dark grain highlights (lowlights??). The bottom chamfer in this case will act as pin-stripe highlighting the natural timber as it will not be finished in the trans-white coating at all. This will leave the thin strip with a dark-grained amber-gold edge which will complement the gold hardware nicely. 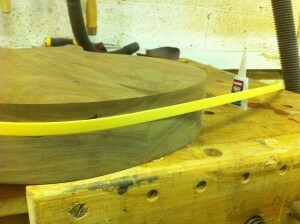 This chamfering was designed originally to give the bottom profile of the Raven body a sharper defined, blade like edge. 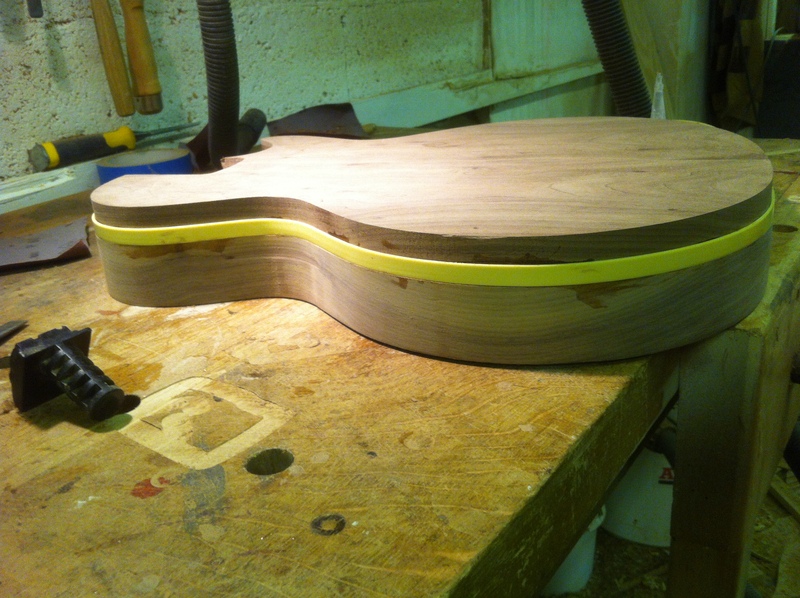 Taking inspiration from other guitar builders, I toyed with the idea of having a strong contrasting colour along this chamfer, like a red or navy blue, but did not want this aspect to be over-bearing. 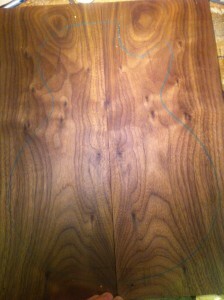 The natural finish will act like a window into the timbers character underneath. 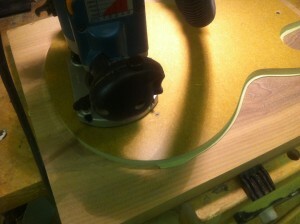 The next step will be to inlay Raven silhouette design into the fretboard. 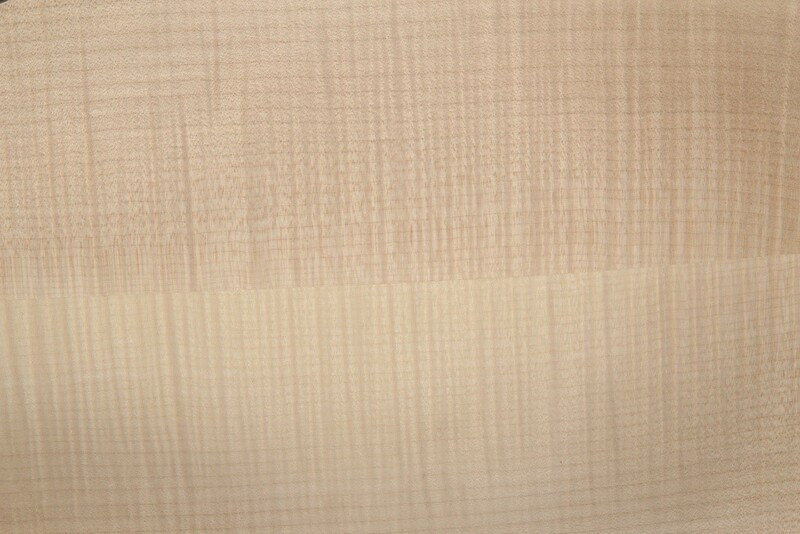 This will be quite large and will be centered on the12th fret, maybe spanning across frets 10, 11, 13 and 14. Originally planned as a single, unique design and build, I managed to get a good deal purchasing the timber and ended up with two Swamp Ash body blanks.With two potential builds, I decided to theme along the lines of Norse mythology primarily as I wanted to create a transparent black, natural finish that would enhance the figuring of the Swamp Ash grain, but also because it seemed cool. 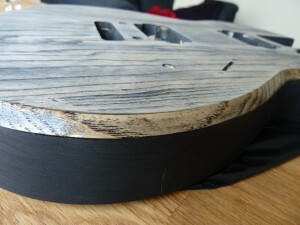 The inspiration for this colour effect was a Raven’s wing, so I decided to theme the builds as Odin’s Ravens, Muninn (memory) and Huginn (thought).The body design was the result of many long hours in consultation with Chloe, aiming for a contemporary mix of Les Paul and Super-Strat body styles whilst keeping our own unique twist. The right horn was finished with a bevelled edge for a sword-edge like emphasis and was cut deep to allow easy access to the high fret area.This guitar was designed to look and feel sharp and edgy, and so I felt it needed a very fast action. 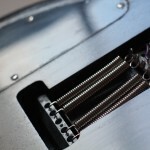 The scalloping process was arduous but worthwhile, and has resulted in a super-slick experience, excellent for both 80’s style shredding and hard SRV style blues-bends. 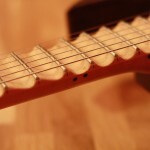 Frets 1 – 11 have been scalloped to a tear-drop profile to allow easier bar-chord playing, while frets 12 – 22 have the more traditional full scallop made famous by artists such as Yngwie Malmsteen and Steve Vai. 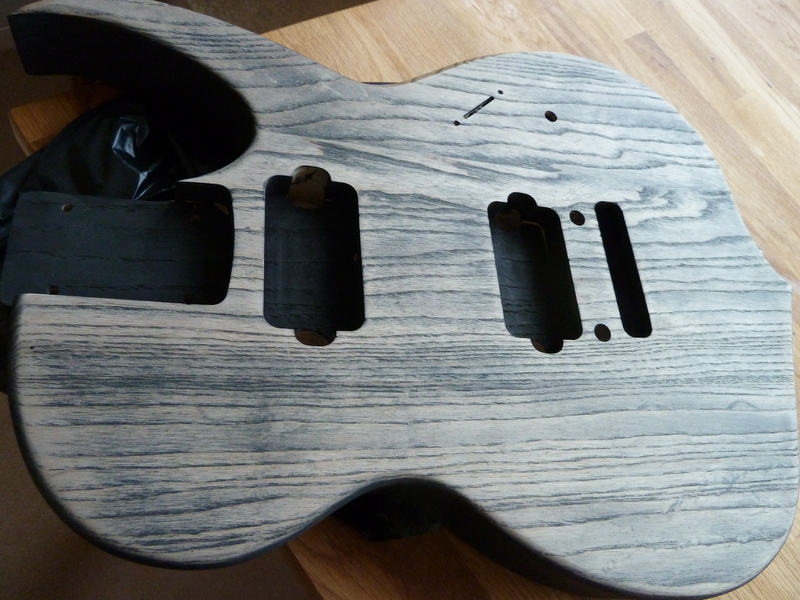 High output passive pickups have been used to give an appropriate darkness to the sound, whilst keeping smooth tones in the Humbucker configuration. Pulling the Volume knob up into position splits the coils resulting in single-coil configuration, for a sharper more vintage sound.